Today is my 20th birthday, and, conveniently, my trusty Lexus RX crossed 220,000 miles just last Thursday. I guess today is as good of a time as any for a little update since my last big post on the car 20,000 miles ago. After my 200,000 mile ode, the Grocery Grabber faced a rather uneventful year. I went off to college, so my dad ended up driving it most of the time. However, it was still my main source of transportation when I was home for breaks, and over the past summer. The big event of the summer was, of course, the OppoMeet, which I’m sure you all know how much I enjoyed. And despite being a Lexus RX, the Grocery Grabber was also the chariot that whisked my father and me around the state of Illinois in my first ever car meet. We put about 750 miles on that day without a hiccup, even with the heat and about 216,000 miles on the car. Towards the end of the summer, we decided that I would end up taking the Grocery Grabber back up to school with me for the upcoming school year. I decided to wax the car to try to protect it as much as possible for the future months parked outside. This was the first time that I had ever waxed a car, and it was definitely a learning experience. The car still cleaned up well, though. Then, about a month after that, my dad ended up effectively replacing it with another Grocery Grabber that’s almost identical, except it’s a 2008 graced with 120,000 less miles and 40 extra hp from the 3.5 V6. The most exciting part of this transaction was that the ’04 RX officially became my car. Winter hit and the Grocery Grabber still was not fazed. Even when the wind chill was -20ºF, it started with only the slightest hesitation. So far over the six months of being continuously exposed to the elements, the only issues I have faced were the two tailgate mounted taillights would fill with water when it rained. A set of taillight assemblies from RockAuto solved that issue. End spot is best spot. I have bonded a lot with the Grocery Grabber over this past year. It has been my faithful companion in every situation I threw at it. I have crammed five people and all of their stuff in the cargo area for a trip home. When I was extremely stressed out, it took me on a wonderful drive where I saw some amazing scenery. 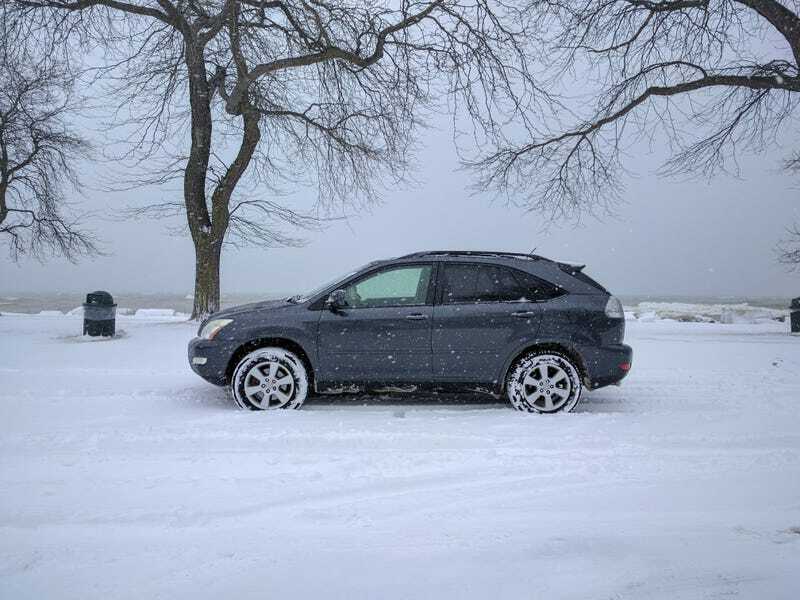 The RX has also been an amazing all weather companion. I seriously cannot say enough good things about it, but I’ll try to keep it short. It took me through a three-hour drive in freezing rain, and just yesterday it took me into Milwaukee in a snowstorm. Each experience was entirely drama free, even on all season tires. I never spun a tire unintentionally once. I couldn’t get the traction control to kick in unless I was intentionally accelerating quickly. When I stopped to take the pictures by the lake, I ended up having to push through a snow mound about a foot and a half tall built up by the snowplows at the exit. Just a little momentum and generous throttle got me through it with no problem. The Grocery Grabber has been the perfect car for me. I could list all of the things that make it work so well, but the most important thing is that it has relatively few sacrifices. The gas mileage could be a bit better, and it is not sporty in any way, shape, or form, but that’s not really the point of a luxury crossover. The Lexus RX is extremely comfortable, practical, decently powerful, and reliable. It truly has been my faithful and useful companion through everything. I guess that’s exactly what it was designed to do, and I must say Toyota did a damn good job.